I've always been a sucker for a good boatswain's call. Oh, I don't mean that silly "Wee-ee-ee" you hear in Star Trek when there is a change of status; I mean the wonderful silver and copper device which was used to issue orders that could be heard above noise and weather. There were any number of calls used to communicate different things, made by opening and closing the hand over the buoy to make the note lower or higher. Besides plain whistling, there were warbles (made by blowing jerkily) and trills (made by rolling an "r" while blowing); by blowing patterns of high and low notes of varying style, most anything that needed to be communicated on shipboard could be said. Using flutes, whistles, and drums to communicate is a very old idea. 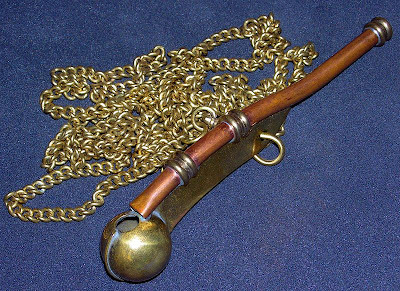 Ancient Greek and Roman ships used flutes to help the rowers keep in step, and the boatswain's call (or bosun's whistle) has been around since at least the 1300s. Not only that, there are numerous whistling languages traditional among mountain peoples, where visual contact can be made over great distances, but the voice is difficult to discern (the exception being, of course, yodeling, which is yet another language). 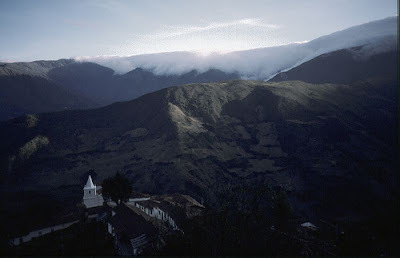 Some places that have developed whistling languages are Nepal, Mexico, Greece, New Guinea and the Canary Islands. Similarly there are also drum languages, used once again to be heard over long distances (though visual connection seems to be less important here). In Africa, drum languages are so common that they are a standard and almost casual auxiliary mode of communication. In Cameroon, for example, the dogs are actually trained to recognize their names when they are drummed - which, if you think about it, isn't much different than sheepdogs recognizing their personal whistles. 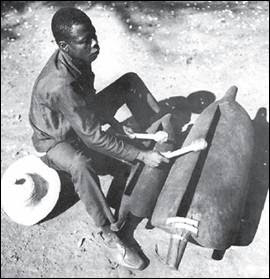 There are a number of ways in which whistling or drumming can work. In some cases, they are direct transmissions of how the spoken language actually sounds. For example, the Sizang people (of Chin State, Burma) have a tonal language, so their whistled language uses an abridgement system - in other words, it drops all aspects of the language but one basic element - to mimic the tones (and then relies on context for the rest). Some languages translate the message into code - like Morse Code, for example, which bears no relation to the actual spoken message but relies on the alphabet to get a more specific kind of message across. Others use a translation system, for example, the Duala (Africa) translate their messages into such archaic synonyms that they are essentially encoding it, because the synonyms have ceased to be used in spoken language, being only retained in their drumming. There's something about this idea, though, that is intriguing. How many of us loved the idea of a secret language when we were kids, something our friends could understand and no one else could? How many of us dreamed about smoke signals, and were fascinated by the stories of identical twins who had developed their own language which they only used with each other? There is something about the idea of being able to change forms, from words to beats or whistles, that takes this idea one step further - because you are not only speaking a language other people can't understand, you are doing it without looking like you are communicating at all. Imagine sitting in class tapping your pencil on your desk. Your teacher thinks you are simply twitchy, but in reality you are passing notes - while looking innocent and attentive. "Eusebio Martinez was observed one day standing in front of his hut, whistling to a man a considerable distance away. The man was passing on the trail below, going to market to sell a load of corn leaves which he was carrying. The man answered Eusebio's whistle with a whistle. The interechange was repeated several times with different whistles. Finally the man turned around, retraced his steps a short way and came up the footpath to Eusebio's hut. Without saying a word he dumped his load on the ground. Eusebio looked the load over, went into his hut, returned with some money, and paid the man his price. The man turned and left. Not a word had been spoken. The had talked, bargained over the price, and come to an agreement satisfactory to both parties - using only whistles as a medium of communication." 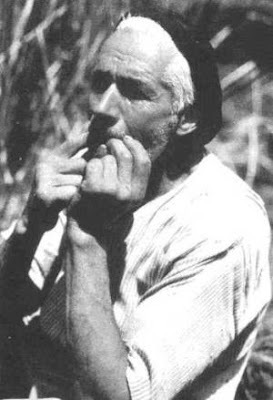 In the Canary Islands, there is a shepherd's whistling language known as Silbo Gomero, or Silbo, which was extremely old (pre-Spanish) and nearly lost by the end of the 20th century. However, the Gomeran government made it mandatory for children to learn Silba in school, and it's making a comeback. There has been a lot of interest in it, even to the point of scientists doing brain scans of Silbadors (speakers of Silba) and finding that when they heard Silba their brains reacted as if they were listening to a language, as opposed to non-Silbadors, who merely responded as if they were hearing whistling. This seems a little pointless to me, since people use it to pass on fairly complex messages, despite its apparent simplicity, so it must be processed like language. It's interesting, the question of "what is language?" Of course, if you ask different people you'll get different responses. People who study the philosophy of language tend to stroke their chins and discuss things like "What is meaning?" and "How can meaning ever really be known?" - which doesn't really answer any questions - while semioticians (who study signs, symbols, and communication) differ from linguists in that they are willing to include things other than words in their definition of language - in other words, "Semiotics differs from linguistics in that it generalizes the definition of a sign to encompass signs in any medium or sensory mode.. it... extends the definition of language in what amounts to its widest analogical or metaphorical sense." [wiki] In other words, they believe that language can exist in any number of situations and ways of expression. The language of clothes, the language of TV, the language of gestures. Which, if you think about it, extends language into all the spheres of our thinking. We are constantly telling each other something, either through a glance, or how we hold our arms; what choose to dress that day, or whether we kiss our sweethearts goodbye. it is all communication. All of which, of course, have entirely different connotations, as they imply completely different choices that you are questioning. The first one asks which umbrella, the second asks whose umbrella, and the third, well, that one can't seem to believe it's really an umbrella at all. So it might actually be tempting to step outside the regular context of "language" as we know it and find some simpler mode of communication. I love talking on the telephone, because I don't have to pay attention to subtle physical cues (either mine or theirs) and can rely entirely on voice timbre. I am charming on the phone, and awkward in person, because I am constantly distracted by the matter of body language: did they hear that last part? Are they bored? Did I just make them angry? ...The telephone is just so much simpler - I can funnel all that energy into my voice, and it makes me focused and comfortable. The modern equivalent of drumming/whistling/etc. is, of course, the text message, either IM or by mobile phone. Whole languages have risen that are completely endemic to the digital environment. When older people moan that young people are being ruined by all this terrible spelling, I reply, "Not at all; they are simply learning another language." Like whistling, drumming, and smoke signals, IM and text messages use code, abridgement, phrases, and even sometimes direct transmission to get the message over a long distance. Nothing new there. For history and how-to of the Boatswain's call, try this, this, and this. Wikipedia also has an interesting entry on it. An odd little website on the pursuit of whistling languages (with sound samples). BBC article on the revival of Silba. A little page on train whistle language. Wikipedia article on communicating through drums. The first has the rolling-eyes emoticon, indicating that there's sense of sarcasm. The second has the heart emoticon, indicating admiration for that quality. The third has the D'oh! emoticon, perhaps indicting that while the statement is true, it's being admitted that it's a frustrating truth. I think also that non-linguistic pop-culture references allow for complex communication. Someone can hum the segue from Dragnet, (DUMM-dada-dum) and indicate (perhaps facetiously) that there is a mystery afoot. Sometimes, this allows the "inside joke" to be open to a large group of people, perhaps even strangers. If a theatre student were to ask me what I'm doing, and the long explanation is that I'm waiting for someone, we had an appointment perhaps, he's extremely late, and I think he'll end up being a no-show, but I must give him ever a little more time, I can simply say, "Waiting for Godot," and all of that will be communicated. It reminds me of the ST:TNG episode "Darmok "where Picard has to learn to communicate with someone whose people only use metaphor. I suggest youtube'in the term "Stacking"
warning explici, but then that is sometimes the nature of communication! I'm the opposite, I hate the phone because I can't see the body cues and it makes me uncomfortable. Can't stand text messaging, chat rooms, or twitter, either, though. Although I love blogs and email.